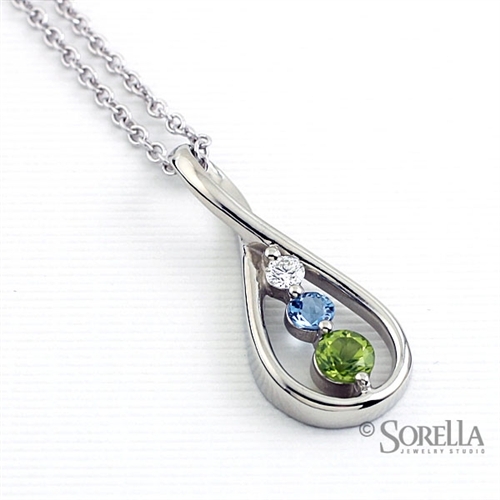 Our graceful swirl of precious metal creates a teardrop frame that cradles 3 gems: 4mm; 3mm and 2.5mm. Specify your choice of stones and we'll set them perfectly in platinum, palladium, gold or silver. Gem Options: 2.5mm (top), 3mm (middle) and 4mm (bottom) diamonds and birthstones are offered. View birthstone selection. Accessory: Add a beautiful Necklace Chain. Chains available in Sterling Silver, 14K Yellow and White Gold, and and palladium in 16, 18 and 20 inch lengths.